The official novelization of the major stop-motion children's movie! Based on the hotly anticipated new stop-motion feature film Early Man, from director Nick Park (Shaun the Sheep, Wallace and Gromit, Chicken Run) and Aardman Animation, coming to U.S. theaters this February. Meet Dug, a scrawny but cheerful caveman who loves his valley and just wants the best for his tribe of misfits. Accompanied by his faithful pig sidekick Hognob, Dug is a dreamer—why settle for hunting rabbits when you can hunt a mammoth?! Then there’s Dug’s tribe, led by the cautious Chief Bobnar. Bobnar wants the best for the tribe, too, but he sees things a little differently from Dug. Then Dug meets the evil Lord Nooth. He’s the leader of the Bronze Age City. When the Bronze Age City invades the valley and the cavemen have to fight to save their home, Dug strikes a deal with Lord Nooth. The tribe can keep their valley if they beat the Bronze Agers at their own game: soccer! Can Dug and Hognob really unite a motley tribe of rabbit-hunters into a serious team? It’s the Stone Age versus the Bronze Age in the match of the millennium! Easy to read and side-splittingly funny, this story about cavemen with heart will appeal to young readers and their parents. 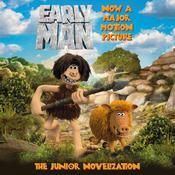 Based on the hotly anticipated new stop-motion feature film Early Man, from director Nick Park (Shaun the Sheep, Wallace and Gromit, Chicken Run) and Aardman Animation, coming to U.S. theaters this February. Meet Dug, a scrawny but cheerful caveman who loves his valley and just wants the best for his tribe of misfits. Accompanied by his faithful pig sidekick Hognob, Dug is a dreamer—why settle for hunting rabbits when you can hunt a mammoth?! Then there’s Dug’s tribe, led by the cautious Chief Bobnar. Bobnar wants the best for the tribe, too, but he sees things a little differently from Dug. Then Dug meets the evil Lord Nooth. He’s the leader of the Bronze Age City. When the Bronze Age City invades the valley and the cavemen have to fight to save their home, Dug strikes a deal with Lord Nooth. The tribe can keep their valley if they beat the Bronze Agers at their own game: soccer! Can Dug and Hognob really unite a motley tribe of rabbit-hunters into a serious team? It’s the Stone Age versus the Bronze Age in the match of the millennium! Easy to read and side-splittingly funny, this story about cavemen with heart will appeal to young readers and their parents.